I stayed at the Mercure for three nights during a business trip; accommodation was company arranged. The hotel is located in / near the city centre with lots of nice dining options around it and in a safe neighbourhood to roam around by foot if the weather permits. The room I was given was very spacious and came with a small kitchenette; the bathroom on the other hand is tiny. and with this I mean my knees basically touched the door of the shower sitting on the wc. Also, there's almost no space next to the sink to place anything. Breakfast was solid, lots of fruits. Taking the price into consideration, it's not a bad deal; yet I just don't like it when reality and pictures on the internet don't really match. I liked be in the Mercury hotel. arrived fairly late and had a warm welcome, very professional check in. came down to the bar and staff were friendly. went to eat at a local restaurant and found that hotel is very well located stayed only for 2 nights. I have been in the hotel for two nights with my wife and daughter. The check in was ok. But the room was old and the air conditioning device was terrible, badly located above and directed to the bodies on the bed. But the worse reason is the lack of reliability. At the check out I asked to the recepcionist guy to check the room's bar to make sure what I had consumed. My family and I wait for minutes and we paid for all and each item that we took. However, I had bought some drinks and let at the room's bar fridge. And I forgot 'em inside the minibar. As I live far away from the city, I just remembered the drinks when I was too far away to come back. But, I trust that the honesty and profissionalism should be observed by the hotel employes. They checked the room consume, I waited for it, and they did not warned me about the drinks that I've forgotten in there. This action in a hotel makes the experience very unconfortable, cause it's hard to trust people that take guests' stuff for them. I hope I never need to stay in this hotel anymore. I was slightly disappointed because the stay didn't match what I was expecting from a Mercure Hotel. There was nothing special. I couldn´t join the breakfast because I was leaving the hotel around 6:00 and the breakfast starts at 6:30 and nobody offered me an alternative. The parking price is too much expensive! During the 2 days I was in the hotel, there was a light in the bathroom that didn´t work. Nobody is checking this kind of thing? But the location is good. We started our stay in another Hotel in Joinville. The Quality was poor. We decided to go to the Mercure instead and were very satisfied. At all the hotel was all right, breakfast was good. Room clean. Nice hotel. Very clean. Some old furniture but that is not a real problem. The coffee from the machine at breakfast was too strong. Add more options at the coffee machine. 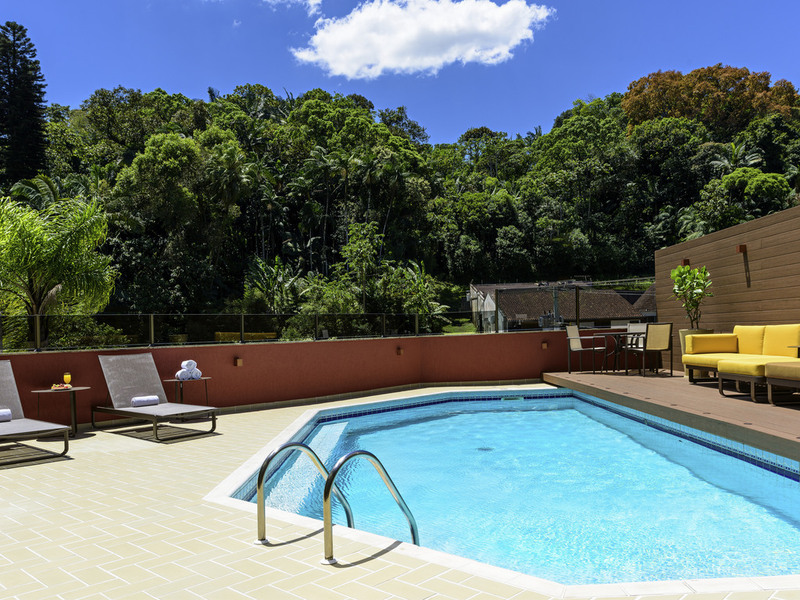 Mercure Prinz Joinville is near downtown. There are several restaurants, bakery, drugstores, hair dresser and shops around. Room was very clean and general hotel services was very good. Breakfast was tasty. 3rd time I've been there. As already mentioned, the hotel has serious issues in services. Wi-fi is definitively useless, and nothing has been done since 1st time (simple solutions, always promised but never considered). The staff is a 10. Attentive, friendly, ready to solve problems. The rooms are comfortable, but the beds are a bit hard. The quality of the food is ok, but could be better. For example, the eggs at breakfast don't have a consistent texture, alternately watery and all stuck together. The lunch restaurant is the big negative. It's terrible. Bad quality and worse service.